Water System Legionella Prevention keeping you up at night? Delta’s NEW Anti-Microbial Cooling Tower Shell is designed to resist Legionella growth in water systems. 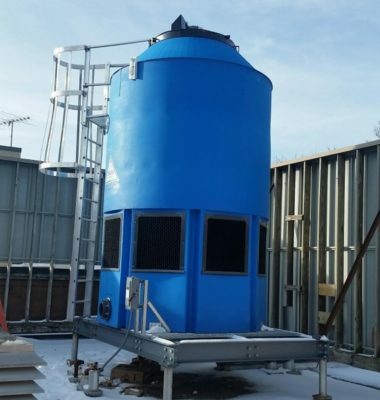 According to Delta, test results from Special Pathogens Laboratory, The Legionella Experts, prove that Delta tower displays the only Anti-Microbial efficacy against Legionella bacteria out of all the common cooling tower materials. The bacteria tested were Legionella Pneumophila Serogroup 1. The base materials tested were Delta Compounded HDPE, FRP, and Stainless Steel and the numbers reflect bacterial count after 24 hour incubation. How do Delta Cooling Towers protect against Legionella? The Tower Shell with Anti-Microbial HDPE resin is compounded throughout, resists bio-film growth and withstands most aggressive chemical treatments. Contact a Kerr Sales Engineer for further information and quotes using the form on the right. Legionella bacteria can cause harmful lung infections. This bacteria grows best in warm water conditions where it is spread to humans when water vapor or mist containing the bacteria is inhaled. Cooling towers have an ideal environment for this growth. Although the public concern about Legionnaire’s Disease was paramount during the outbreaks of the mid-1970s, there have been many recent occurrences since then, including over a dozen cases in the U.S., as well as several in Europe and Australia. According to the CDC, in many of these cases Legionella is incubated and spread through water systems, including the cooling towers that are essential items in commercial building HVAC systems and industrial process cooling. Chemical Water Treatment: Oxidizing Biocides are recommended as the best mode of control. Warning: this type of biocide can be aggressive towards metal surfaces; specifically, metal cooling towers.